So, this happened just recently. Not sure what to make of it since it is a) From Pappy and b) flies against his own story that is still up on the Loremaggedon Aurin page. He corrected it so that the average is 70. But yeah. Average implies that your Aurin male or female reasonably healthy will live to seventy. Females will live over that maybe 80? And Matrias 90... or longer since we're going to make things up. I think at this point it's safe to say they basically have the same lifespan as humans. I'm ok with this. A few more things about Aurin from HernCo on Reddit, some of it may cause a few issues out there...dunno though. This is compiled from both threads on the Wildstar subreddit. I may have missed a few, but it's "late" for me at this point. You can find them here, and here. A: My cat has done almost all of these things, so I'm going to say "yes" to everything except actually being able to hold objects. Q: How do veggies work? A: There are wild varieties and domesticated varieties (the latter can be found on the Exile arkship when you're helping Queen Myala). Yes, the Aurin raise sentient vegetables, and many Aurin are vegetarians descended from predators. Make of that what you will. A: Only the "domesticated" varieties are raised and eaten like this for the most part. It is not without controversy among the Aurin (and other cultures who are all, "Wait, but WHAT? "), but they were descended from predators. And it goes to show that despite their shiny, happy veneer they are not without their dark (or at least practical) sides. Q: Do wing-aurin have bones in their "ears"? Q: Do Aurin have any particularly unique uses for their ears? We know their tails are all prehensile, but what about their widely varying ears? A: They're pretty much for hearing, although that can extend into vary levels of skill at echolocation. The different ears originally evolved in different types of forests environments, though since they left Arboria those different ears are just part of the genetic mix. Q: How do wing-eared aurins hear? A: Anyway. With ears, it's not the shape of the part you see but the composition of the part you can't. The inner ears of all Aurin start at the base of the ear and then work pretty much as you'd except (even though they're positioned differently from human ears). The wing-ears evolved in a part of Arboria where that shape was particularly conducive to hearing the sounds that those proto-Aurin needed to hear to stay alive. A: However, the process of birth, weaning, and infancy in Aurin still have some hereditary commonalities with their pseudo-marsupial ancestors. Newborn Aurin cannot survive on their own, so Aurin mothers remain in nurseries with them until they are old enough to be separated from them. This period is usually less than a week. Aurin consider their "awakening day" (i.e., the day their eyes open - usually 7 days after birth) to be the true beginning of their lives. Q: Aurin - How sharp are an aurin's natural claws? A: Depends on how much they sharpen them. Some Aurin keep what are essentially scratching posts in their homes for this purpose, but they usually only use them in private. It kind of creeps humans out. Q: WHY DO FEMALE AURINS HAVE FOUR TOES? A: The fifth one is vestigial in most females. They're like wisdom teeth for their feet! A2: Er, except they don't have them removed if they start coming in. Look, it's almost 3 in the morning here and I need more coffee. Q: Why do all female Aurin and Mordesh have five fingers and four toes, when their male counterparts have five of each? A: Evolution. The females of each species have vestigial fifth toes for reasons lost to prehistoric natural selection, although many scientists believe that A) males retained the fifth toes for primitive mating displays in the ancient past and B) this means there could be an extremely distant genetic link between the Mordesh and the Aurin. It's a pretty old galaxy, after all, and who's to say how various life forms came to arise on their various homeworlds? Still, since it's a theory revolving around pinky toes, many other scientists don't necessarily take the second hypothesis all that seriously. Felinoid Aurin don't purr intrinsically, but there's no reason they couldn't fake it. Q: How exactly do Aurin age? We know that they don't show traditional signs of aging that any species can really work out (aside from other Aurin, that is), so how would another Aurin be able to tell the age of another? A: Aurin age like most other organic beings. They simply don't show as many external signs, largely due to dwelling in regions dense with primal life energy and communing with the Weave. But other signs of age and stress - such as hair color going white - can be clues to an Aurin's age. Q: Are there any Aurin that have "Gone Native" on Nexus, so to speak? Or are they all still huggyfluffy and loyal to the Queen? I'd love to see a tribe of feral Aurin. A: What you're describing isn't impossible, and there's no reason we couldn't see something like that. Aurin have a wild nature and predatory instincts, if (for example) Aurin children were left to survive on their own they could become quite dangerous. But you've also hit on a larger conflict within the Aurin - whether to literally "go native" on Nexus by adapting to the forms of life (especially the Nexus equivalent of Arboria's Wisdom Trees) on the Eldan planet or to go back and fight. I'm not sure if you've met the Thorns of Arboria yet, but they're a group that thinks the Aurin should take advantage of the Dominion's focus on Nexus to return to Arboria and liberate it. The queen's not sold on this idea at all, and for now intends to stay on Nexus. Q: How does Aurin culture view those who are outside the gender binary? Can somebody who is Weave-sensitive but doesn't identify as female be a Matria? 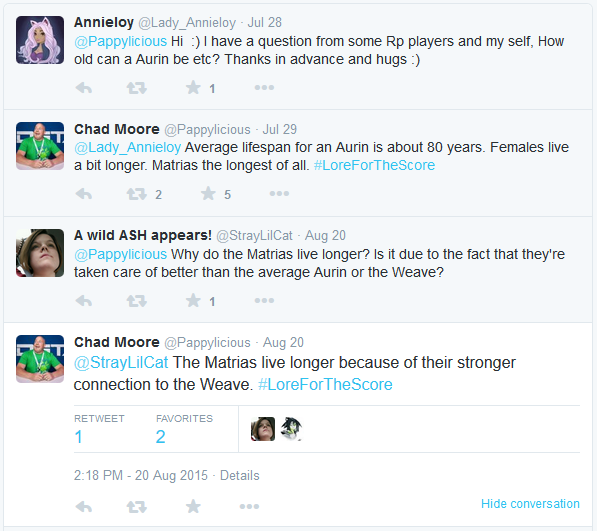 A: This is an excellent question and one I almost touched upon in my earlier answer about matrias. But frankly, it's a topic I don't want to treat lightly, so I chickened out. Let me unchicken: yes, absolutely, a Weave-sensitive female-identifying Aurin could, if she was able to meet the requirements and had the raw ability, become a matria. No question. Is it common? No. But definitely something that can happen. Q: I would also like to have more information on the Weave. Some examples that would be nice to know, is it possible to use the Weave to 'attack' someone aggressively? What percentage of Aurin, roughly, have a strong connection to the Weave? Is it possible for a male to have a stronger than average connection to the Weave? A: I'd say that using the Weave for aggression would be difficult. It's closely related to the energy of life, which is why many Aurin have such a strong connection to it - though perhaps 15% or so have a strong enough connection to become matrias. A male can certainly have a stronger-than-average connection, but doesn't qualify to be a matria for other reasons. It's not exactly egalitarian, I guess, but it's the Aurin way. Q: Before the ravaging, how much technology did the Exiles trade with the Aurin? Did they trade spellslinger guns or stalker nanites at all? A: Sure, they would have traded such things if they could be spared and if the Aurin were interested. Such things ended up being more evidence of their "treacherous dealings with the hated Exiles" when the Dominion discovered them. Meaning yes, in a way the Exiles making contact with Arboria led to its downfall - though most Aurin squarely put the blame on the Dominion. Q: Was there only one form of faith on Arboria? If so, were there different sects of that faith? A: "Faith" might not really be the right word here - it's more like a form of empathic animism, in that they don't just believe the trees and creatures possess spirits and souls, they actually know it thanks to the matrias' connections to the forests. Rather than sects, you might get some regional differences that line up with the types of forests where those groups dwelt, but the core of their beliefs would be the same wherever they were. Fun fact: Aurin ear differentiation was also originally due to the different types of forests in which they lived. A: The Aurin definitely have issues. Not sure how far you've gotten into the game, but their entire forest homeworld of Arboria is currently being ravaged by gigantic planet reapers designed by Mondo Zax. A lot of Aurin disagreed with Queen Myala when she decided to abandon Arboria and flee with as many of her people as she could to the Exile fleet (and eventually Nexus). Her own first consort, Arwick Redleaf, feels strongly that they should return - both to save Arboria and the Aurin left behind, and because his beloved queen is dying from being separated from the Wisdom Trees of their home for so long. The queen, however, has begun to connect to the similar trees found in certain regions of Nexus, and is pretty set on staying here and surviving. This even though it's incredibly painful for her physically and personally (because of Arwick). And while her health is turning around and getting better the more she connects to the trees of Nexus, she still feels the pull of home in her heart. It's been so long... Hello friends. I feel bad. It is nice to see this is here and has had some updates over the past year and a bit. Been trying to keep it updated with the info as it comes out to us! Been a while since anything really new, but always here for more insights from players, devs, and wherever else we find 'em! That's always good! And yeah it seems like it. I've been having the old WildStar inkling a lot lately. I do miss the game. And my Aurin.